I’m currently reading John Lane’s excellent book, Coyote Settles the South. It is an excellent book, and I will be reviewing it here very soon. The whole time I’ve been reading it I thinking about my encounter with the male Eastern coyote I called in back in March. He’s not exactly the same coyote that Lane is writing about. He’s a coyote of the gray woods, not the subtropical pine forests and river bottoms. But in some ways, he is the same. He is the same creature that has adjusted to all that Western man can throw at him and thrived. And he’s thrived at the expense of the wolves that once roamed over the Northeastern US and the South. He’s just the right size to live on a diet of rodents and rabbits but also has the ability to pack up and hunt deer. He can be an omnivore, enjoying wild apples and pears that fall to the ground, almost as much as he would if he came across a winter-killed deer. The coyote is a survivor. I’ve written on this space several times that the reason he has thrived is because he has been here far longer than the wolves that once harried his kind. Until last week, it was assumed that the coyote split from the wolf some 1 million years ago. This million year split has been used for virtually every study that has examined the relationships between different populations or species in the genus Canis. It is used to set the molecular clock so that we can figure out when wolves and dogs split and perhaps give us some idea as to when dogs may have been domesticated. This assumption has been directly challenged in a new study that was released in Science Advances last week. The paper examined full genome sequences of several different canids, and it can be argued that it pretty much ended the debate as to whether the red wolf and Eastern wolf are species. They aren’t. Instead, they are the result of hybridization between wolves and coyotes. Most of the media attention has paid attention to this discovery in the study. It’s the most important practical implications, because the US Fish and Wildlife Service delisted the gray or Holarctic wolf in most of the Eastern, Southern, and Midwestern states in favor of protecting the Eastern and red wolves. Red wolves are called Canis rufus, and Eastern wolf is Canis lycaon. With them being recognized as hybrids, this greatly complicates the issue of how to conserve them under the Endangered Species Act, which, as its name suggests, is meant to conserve actual species and not hybrids between species. The authors of the study feel that these hybrid populations are still worth conserving, largely because the red wolf contains the last reservoir of genes belonging to the now extinct wolves of the Southeast. But in order to make this work, we’re probably going to have to rewrite the Endangered Species Act, and that is not going to happen any time soon. However, the finding in the study that is worth discussing more is that not only showed that red and Eastern wolves were not some relict ancient species of wolf. It is the finding that coyotes and wolves split only 50,000 years ago. Using a simple isolation model and a summary likelihood approach, we estimated a Eurasian gray wolf–coyote divergence time of T = 0.38 N generations (95% confidence interval, 0.376 to 0.386 N), where N is the effective population size. If we assume a generation time of 3 years, and an effective population size of 45,000 (24, 25), then this corresponds to a divergence time of 50.8 to 52.1 thousand years ago (ka), roughly the same as previous estimates of the divergence time of extant gray wolves. This finding means that the studies that use that 1 million year divergence time to set the molecular clock for all those dog domestication studies need to be reworked. This is going to have some effect on how we think about dog domestication, and although the domestication dates have been moved back in recent years, the actual split between dogs and wolves is likely to be much later than when we see the first signs of domestication in subfossil canids. That’s one important finding that comes from this discovery that wolves and coyotes are much more closely related. The other is that yes, it did pretty much end Canis rufus and Canis lycaon as actual species, but it probably also ends the validity of Canis latrans as a valid species. Coyotes could be classified as a subspecies of wolf. Indeed, they are much more closely related to wolves than Old World red foxes are to New World red foxes, which split 4oo,ooo years ago. And there is still some debate as to whether these two foxes are distinct species, because we’ve traditionally classified them as a single species. Plus, if we start splitting them into two species, we’re likely to find the same thing exists with least weasels living in the Old and New World. And the same thing with stoats. And then it’s not long we’re fighting over the house mouse species complex. But if we’re going to lump red foxes, it’s pretty hard not to lump coyotes and wolves. It is true that wolves normally kill coyotes in their territory, but it also found that wolves in Alsaska and Yellowstone, wolves that were thought to be entirely free of any New World ancestry, also had some coyote genes. So the coyote, like the extinct Honshu wolf and the current Arabian wolf, could be correctly thought of a small subspecies of wolf. We know from paleontology that in both North America and Eurasia there were various forms of canid that varied from jackal-like to wolf-like, and although we know the jackal-like form is the earliest form, these two types have ebbed and flowed across Eurasia and North America. We’ve assumed that the jackal-like forms gave became the coyote and the larger wolf-like forms have become the gray, red, and dire wolves. But what we’re looking at now is the coyote isn’t the ancient species we thought it was. It’s very likely that some ancestral wolf population came into North America, and instead assuming the pack-hunting behavior of Eurasian wolves, it tended toward the behavior of a golden jackal. When this ancient wolf walked into North America, it would have found that the pack-hunting niche was already occupied by dire wolves. There were many other large predators around as well, and evolving to the jackal-like niche would have made a lot more sense in evolutionary terms. This is what the coyote is. The pack-hunting modern wolf came into the continent and took it by storm, and the coyote exchanged genes with it. They lived together as sort of species-like populations in the West, but when wolves became rare from persecution following European settlement, the coyote and wolf began to exchange genes much more. So with one study using complete genomes, the entire taxonomy of North American Canis is truly blown asunder. And the implications for dog domestication studies and for the practical application of the Endangered Species Act could not be any more consequential. Very rarely do you get studies like this one. It changes so much, and the question about what a coyote is has become unusually unsettling but also oddly amazing. I will never think of a coyote the same way. The mystery is even more mysterious. Eastern North American wolf subspecies (Canis lupus lycaon). This is the wolf that likely lived in West Virginia. From The Annals of Webster County, West Virginia (1941). The story is by Daniel Stoffer Hamrick, who was 17 years old when he killed this, the last West Virginia wolf. During the last 40 years there has been a lot of controversy about the wolves still roaming the woods and hills of West Virginia. The following article may set at ease some minds which still believe they hear the cries of the wolf at night. On January 8, 1897,the last gray or timber wolf was killed in West Virginia, according to my belief. Some eight or ten years before that date, wolves were playing havoc with sheep in Webster, Pocahontas, Nicholas, Braxton, Greenbrier, and Randolph Counties. About 1891 or 1892, John Gregory killed the mother wolf and one or two of her young. From that time on for five years the male wolf was the lone representative of his tribe in the West Virginia mountains. He ravaged sheep far and wide. One night he would kill only one and the next night a great many. On the night of Jan. 20, 1895, the wolf killed 27 lambs owned by my brother, Jacob Hamrick, on Point Mountain, Randolph County. The wolf was often hunted and traps were set for him to no avail. The county courts of Randolph and Webster Counties offered separate bounties of $100 each to the person who would bring the scalp of this wolf to them. The farmers of the mountain region were discouraged. They said they could not afford to raise sheep as the wolf killed the most of them. On New Year’s morning, 1897, Uncle John Hamrick, who was living on a farm near Whittaker’s Falls of the Elk River, came down to my father’s house and said that on the previous night the wolf had killed five of the best sheep that he had, a loss of at least $50. This I did and I found Mr. Sharp in a willing mood. When we returned with the dogs we learned that the wolf had been tracked into a thicket on Point Mountain, just above where Currence Chapman then lived. We built a campfire but we didn’t have anything to eat. Brother Jacob said that if someone would go after it, he could get a horse at his place on which Lilly could ride. Brother Lee said he would go and I went with him. We walked three miles up Point Mountain to the farm. Shortly after we left the campfire someone produced a bottle of hot drops and told Lilly that if he would take some he would be all right. Adam, who had been the leader of the party from the start, remarked so Lilly could hear him, that there was nothing wrong with him except that he had given up. Either the hot drops or Adam’s insult did the work for when we started down the mountain with a pair of horses we met the whole part coming with Lilly in the lead. One morning we were on stands on the Upper Elk. The wolf came within 50 yards of John Dodrill and stopped. He had a new gun, either a Winchester or a Marlin. John took dead aim and pulled the trigger but the gun didn’t go off. He tried again, and again the gun refused to fire. The wolf had enough of the fooling around and disappeared. When we came up, John said: “Men, that wolf is not to be killed.” We hunted in the snow and found the two cartridges which had failed to discharge. We put them back in the gun and they both went off this time. We went that morning to the spot where we quit the night before, the head of Back Fork of the Elk. Adam told Jacob Hamrick and Milton Hull to hold the dogs for one hour and 20 minutes until he could have time to place the men on stands. We all went down to the fork of the stream and took stands. Lee Hamrick stood close to the creek. Alva Sharp stood above him, and I was next. Laben Hull was next above me and John Rose above him. The rest were strung out in like manner on up the mountain. I could see Mr. Sharp below me and Mr. Hull above me. The others came up and measured the distance of my shot at 187 steps. It was then one o’clock. There was much rejoicing that our enemy was dead and that our cold and painful tramping was ended. We walked from there to Laben Hull’s and danced all right. The next day everyone within a radius of several miles came to see the wolf. We weighed the wolf at Mr. Hull’s and discovered it weighed 87 pounds. It had eaten nothing in the eight days except one grouse. We didn’t give it time to kill any sheep in that period. I took the scalp to the county court at Webster Springs but the court refused to pay the bounty. After finding a man for my guardian, and I was only 17, I employed the late Senator E.H. Morton, a very able attorney. He brought suit against the county court and secured judgment in justice court. The court appealed the case to the circuit court. But when we came up for trial the court compromised and paid the bounty. If there are any of those who would scoff at the above story, I refer them to the above men now living and to the court record of Webster County (pg. 255-258). This region in West Virginia is deep within the heart of the Allegheny Mountains. It doesn’t surprise me that this was the last redoubt of the wolf in the state. Not very far from here, at Valley Head in southern Randolph County, the last of the Eastern wood bison, which ranged as far north and east as Western New York, was killed in 1825. This wolf was part of a breeding pair, but his mate and pups were killed. Forced to make a living on his own, he began to regularly haunt the sheep pastures. Natural prey must have been quite scare in those days, for the only contents of the wolf’s stomach was a paltry grouse. A grouse is pretty hard for a dog or wolf to catch. After all, they do fly when something tries to pound upon them. So this wolf would have been pushed to his limit to be forced to waste energy hunting ruffed grouse just to survive. In West Virginia, people still claim to see wolves. In reality, they are almost certainly seeing the larger Eastern coyotes, which do have some wolf ancestry. But a wolf was recently killed in Missouri. It was later confirmed to have come down from the Great Lakes wolf population— most likely Minnesota, if my geographic sense is correct. A wolf of a very similar size to the one Hamrick killed was shot for killing sheep in Massachusetts. This wolf was believed to have wandered down from Quebec. It is also very likely that wolves occasionally show up in the remote haunts of northern Vermont, New Hampshire, Maine, and the Adirondacks of New York, which is a proposed site for a wolf reintroduction. So it’s possible that a wolf will one day wander into West Virginia, but by the time they get here, they will have already established themselves in other parts of the East. I don’t for a minute think the (contrived) red wolves of North Carolina will come up here. That population is already tightly managed and is largely restricted to a peninsula on the Carolina coast. I don’t think the wolf that Hamrick killed was a red wolf or an Eastern wolf. The best science on the genetics of these animals shows that they are recent or relatively recent wolf and coyote hybrids. This wolf was likely part of or closely related to the Eastern North American wolves (Canis lupus lycaon) that are now most common in Quebec and Ontario. 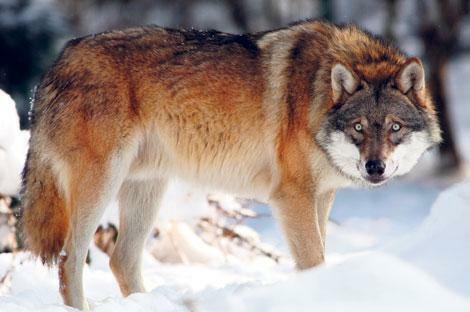 The Massachusetts wolf that was killed in 2008 was of this subspecies, and it would be the subspecies that would be reintroduced into Northern New England and New York State. Many members of this subspecies have coyote mtDNA, which was once used to declare them a new and unique species. The truth is that many of them derive from a female coyote ancestor. That’s why they have coyote mtDNA. Their nuclear DNA shows that they are wolves with quite a bit of coyote in them. The red wolf, by contrast, is a coyote with some wolf in it. I’m sure that many states have some record of their last wolves, and I’m sure that most of them involve stories about wolves tripping traps and slaughtering whole herds of cattle. But I don’t know of many states that have one about a 17-year-old crack shot bringing the last wolf down.